Download "PMI Certified: PMP - Project Management 5 Days"
1 (208) PMI Certified: PMP - Project Management 5 Days Course Description This PMP certification training class is designed for individuals who have on-the-job project management experience (whether or not project manager is their formal job role), who are not certified project management professionals, and who might or might not have received formal project management training. The course is appropriate for these persons if they wish to develop professionally, increase their project management skills, apply a formalized and standards-based approach to project management, and seek career advancement by moving into a formal project manager job role, as well as to apply for Project Management Institute, Inc. (PMI) Project Management Professional (PMP) certification. 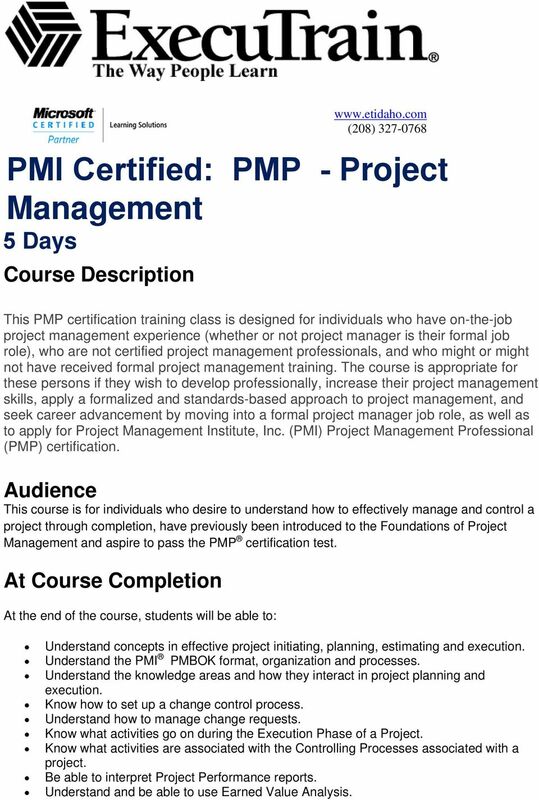 Audience This course is for individuals who desire to understand how to effectively manage and control a project through completion, have previously been introduced to the Foundations of Project Management and aspire to pass the PMP certification test. At Course Completion At the end of the course, students will be able to: Understand concepts in effective project initiating, planning, estimating and execution. 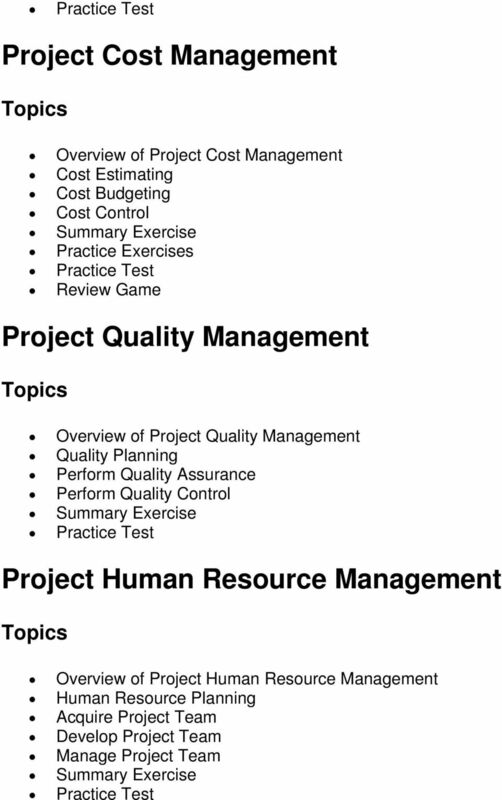 Understand the PMI PMBOK format, organization and processes. Understand the knowledge areas and how they interact in project planning and execution. Know how to set up a change control process. Understand how to manage change requests. 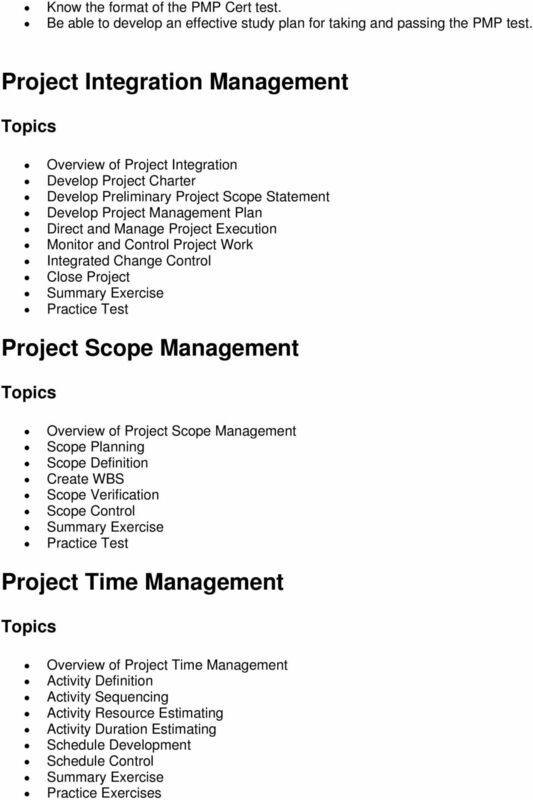 Know what activities go on during the Execution Phase of a Project. 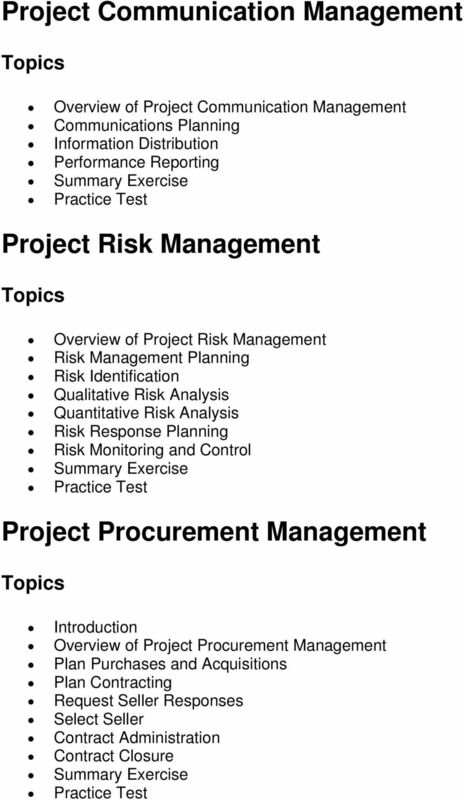 Know what activities are associated with the Controlling Processes associated with a project. Be able to interpret Project Performance reports. Understand and be able to use Earned Value Analysis. 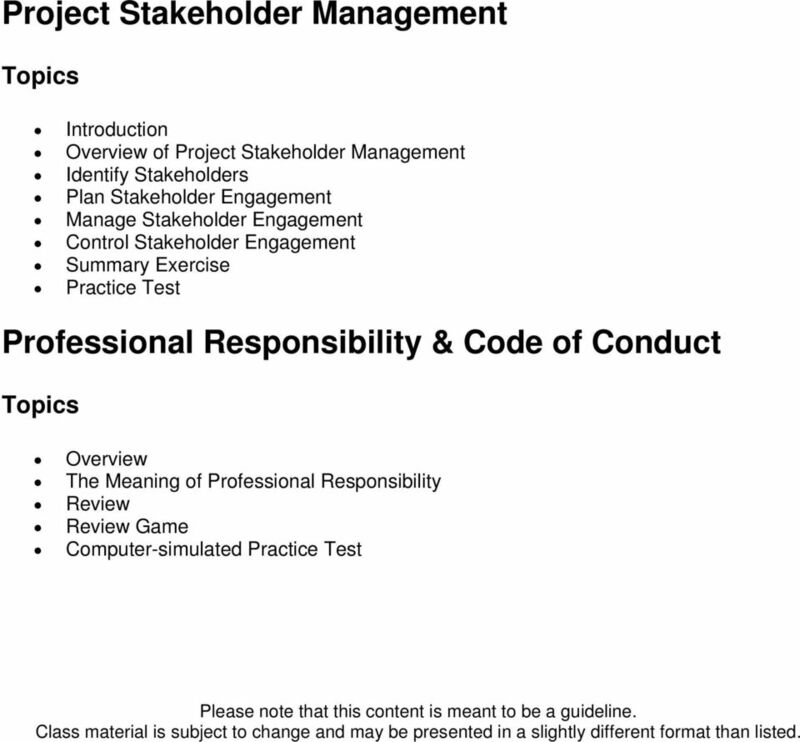 5 Project Stakeholder Management Introduction Overview of Project Stakeholder Management Identify Stakeholders Plan Stakeholder Engagement Manage Stakeholder Engagement Control Stakeholder Engagement Professional Responsibility & Code of Conduct Overview The Meaning of Professional Responsibility Review Review Game Computer-simulated Please note that this content is meant to be a guideline. Class material is subject to change and may be presented in a slightly different format than listed.